Moore's Farm community is sold out and is not in active development by builder. 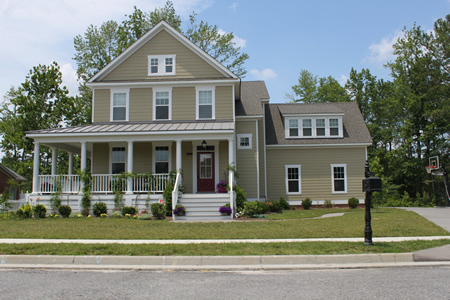 If you are interested in Moore's Farm or similar new home communities, contact us today! Our agents are very familiar with new and newer construction in Chesapeake, and can identify resale opportunities in Moore's Farm, as well as builder inventory available in nearby or similar communities in Chesapeake. To view 6 more pictures, interactive maps and the full, detailed description of the Moore's Farm community, please Login. New home communities with energy-efficient houses for sale are not always as elegant as they are in Moore’s Farm. Properties here are stellar pieces of architecture just waiting for new owners. Situated in a prime spot within Chesapeake, VA, this development is one that will get people talking and keep them interested for years to come. This location provides homebuyers relatively easy commutes to military bases like NAS Oceana, the Coast Guard Finance Center and Naval Medical Center Portsmouth. No need to rush through a tour of this neighborhood, as this is not one of those average new home communities. Properties here are special and command attention. Houses for sale at Moore’s Farm feature 30-year architectural shingles, vented attic, professional landscaping, custom exterior lighting, radiant barrier roof and more. When you open the door to one of these properties for the first time, the difference between Moore’s Farm and other new home communities becomes quite clear. Each of the houses for sale here come with 10-foot ceilings, crown molding, ceiling fans with lights, custom Merillat cabinetry, brushed nickel Schlage door hardware, granite countertops, garden tub in master bathroom, Trane dual-zone heating and cooling system, fireplace with switch, exhaust fans for each bathroom and much more. Virginia has many regions that are worth checking out and Chesapeake is certainly one of them. This city is filled with new home communities, shops and picturesque sites. Residents can bring their clubs and hit the courses at both the Chesapeake Golf Club and Cahoon Plantation. Discover the beauty of trees in the Chesapeake Arboretum. And best of all, send teens to the acclaimed Grassfield High. This school is rated as one of Virginia’s best high schools and parents throughout Hampton Roads appreciate this school’s distinction. Houses for sale in this esteemed neighborhood can provide the right setting for the life you’ve wanted. Properties give residents the ability to live in the city without losing that country charm. See what it feels like to come home to Moore’s Farm. Send me more information about communities similar to Moore's Farm. Our agents gladly offer FREE property tours of Moore's Farm, Chesapeake and homebuyer consultations to all serious buyers.